In spite of a chilly couple of evenings here in New York, it’s summer, and with summer comes the sweet arrival of fresh strawberries at the farmers market. The moment is extra special because it heralds more summer berries and fruits to come, and I’ve been celebrating by putting strawberries in and on everything—this balsamic tofu, quinoa & strawberry summer salad included. Technically the salad spans the seasons—it’s got radishes, baby greens, and green beans, which are abundant in spring, but the strawberries give it a summery feel for sure. I love how the bitter radishes contrast with the juicy, plump sweetness of the fruit. 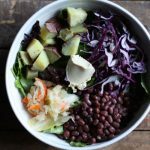 I mentioned recently that in spite of it being warmer now, I still tend to go for grain salads with plenty of plant-based protein, especially if that salad’s intended to be a meal. There’s protein aplenty here, both from quinoa and from firm, seasoned cubes of balsamic marinated tofu from Nasoya. I’ve been a huge fan of Nasoya tofu for a long time; the extra firm and super firm options are almost always my go-to for baking and sautéing. 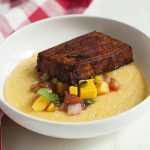 I love their texture (I like my tofu on the uber-dense side, which they are) and the fact that the brand has made tofu and soy foods so accessible to so many home cooks across the country. This was my first experience using the brand’s Toss’ables, which are pre-cubed, pre-seasoned, and ready to eat. They come in two flavors, Balsamic Vinaigrette and Garlic & Herb, and for me balsamic was the clear winner. I love its sweet tart flavor, and the texture is perfect. I’m always inviting my clients to keep pre-baked or seasoned tofu in the fridge as a handy protein option for busy times and for dishes just like this one. Experience has shown me that protein often falls by the wayside when folks don’t have enough time to meal prep. So happy to add this tasty option to my repertoire of suggestions! The rest of the salad pretty much speaks for itself: fluffy quinoa, chopped green beans, radishes, strawberries. And, oh yeah—the balsamic Dijon tahini dressing that I just can’t get enough of 🙂 Here’s the recipe. Cook the quinoa according to package instructions. Fluff the grain gently and allow it to cool to room temperature. Combine all of the remaining ingredients in a large mixing bowl and toss well to combine. Serve. There’s so much nutrition here; it’s most definitely a power plate! 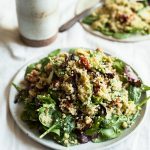 Oftentimes I find that summery salads don’t quite have the macronutrient balance that I need to stay full (protein + complex carb + healthful fat), but this one does—with plenty of fresh, seasonal flavor. A new keeper for me, for sure. Speaking of all this, so happy that a bunch of you have already made the balsamic Dijon tahini dressing and loved it. If you’re enjoying it in your kitchen, you’re enjoying it right alongside me! Wishing you all a sweet rest of the week. See you this weekend for some reads and recipes. This post is sponsored by Nasoya. All opinions are my own, and I love this go-to brand of tofu and soy foods! Thanks for your support. This looks so easy for a weeknight dinner! I love having proteins prepped in advance–what a great product. And what a great salad! Looks delish. Just made this salad and it was amazing! Thanks for sharing! This looks amazing! Any other vegetable you recommend in place of green beans. I’m not a huge fan. Thanks! I think zucchini, summer squash, or chopped broccoli would all be great!